In 1935, the Pennsylvania Mirror referred to a Wall Street adage, “Sell before Rosh Hashanah; buy before Yom Kippur”. Recently an academic paper quoted this article and set out to establish if the adage was true and still valid today. The theory is that the market is weak during the approximately seven trading-days gap between the Jewish New Year (Rosh Hashanah ) and the Day of Atonement (Yom Kippur). To test this theory the authors studied the results of short-selling the Dow Jones Industrial Average on one of the three days before Rosh Hashanah and buying back on one of the three days following Yom Kippur. They analysed the nine different combinations of trade dates, i.e. selling on the third day before Rosh Hashanah (R-3) and buying back on the day after Yom Kippur (Y+1), R-3 and Y+2, R-3 and Y+3, R-2 and Y+1 etc. The period tested was 1907 to 2008. The paper found that the mean returns for the DJIA for the nine trade dates considered ranged from -0.47% for R-3 and Y+2 (i.e. shorting three days before Rosh Hashanah and covering two days after Yom Kippur) , to -1.01 for R-2 and Y+1. In other words, they found that the market had indeed been weak between the two Jewish holidays, and that five of the nine scenarios yielded statistically significant results. They checked to see if this Jewish Holiday Effect might have diminished in recent years and found that the effect over 1998-2008 was actually stronger for six of the nine trade scenarios than for the prior period 1907-1998. So, what’s the reason for this? The authors of the paper found that this was not a result of the influence of other anomalies (e.g. the weekend effect), nor was it the result of data outliers. One Wall Street trader gave the traditional explanation that people of the Jewish religion “wished to be free (as much as possible) of the distraction of worldly goods during a period of reflection and self-appraisal.” Of course Jewish traders are only a small part of the market, but at the margin their withdrawal from the market over this period may increase volatility and risk and thus discourage others from trading, and then the arbitrage traders exploiting the effect can make it self-fulfilling. Is this a peculiarity of just the US market, or is the effect present in other markets? The above cited paper starts by quoting a 9 September 1915 New York Times article titled “The London Market Quiet – Jewish Holiday Causes Small Attendance on the Exchange”, the newspaper reported that money and discount rates on the London Stock Exchange were “easy today” and attendance at the exchange was low due to the Jewish holiday of Rosh Hashanah. So, might this effect still be in force in the London market today? The following chart shows the mean returns for the FTSE 100 Index for the nine combinations of trade dates (as above) for the period 1984-2013. As can be seen, the market was weak for all nine combinations of trade dates over the Rosh Hashanah to Yom Kippur period. The weakest combination was for selling on the third day before Rosh Hashanah and buying back on the second day after Yom Kippur (T2) when the mean return has been -1.3%. The Jewish Holiday Effect would therefore seem to be as strong in the London market as that in New York. 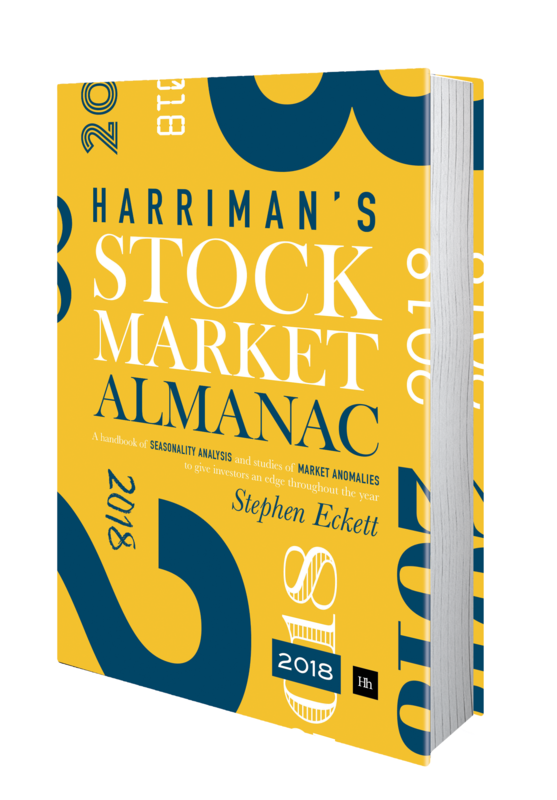 The above is an extract from the Harriman Stock Market Almanac 2017. This entry was posted in Day analysis, International, News, October by Almanacist. Bookmark the permalink.